Sometimes you feel like changing the language that you chose on installation. The language your Sims speak can’t be changed, that’s simlish. This tutorial is about the text messages and the user interface. Not all languages are available in all versions. The DVD Region 1 only contains English, Spanish and French, Region 2 has a few more but I’m unsure whether it has any of the Asian languages. If you can install the game in a certain language, you can use it. I’m unsure how it works for the download version atm but I’ll add the info as soon as I have it. If you newly install an expansion or stuff pack, you can’t choose the language. The expansion is automatically installed in the language the base game is in (as long as it’s available on the source). The language of the installation routine does not matter for the language of the game. If you manually change the language in the registery, you need to change it for all expansions you have installed. Please only change stuff in the registery if you feel qualify to do so. Changing the wrong values can mess up your game and/or Windows. I don’t know if the value under Country needs changing too. Mine is set to CH and I play in English and I have no issues. Start the game. Your user files, including saves will be gone now as if you’ve renamed the user folder. Close the game and go to documents\electronicArts. You should have two folder in here now. One in your old language and one in the new one. 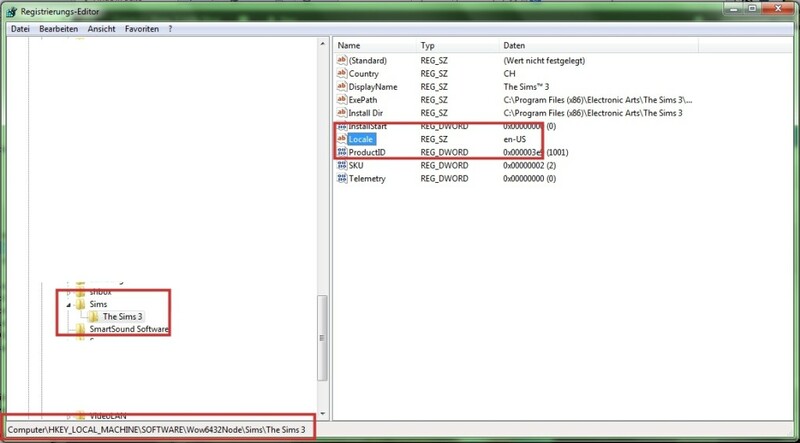 To recover your old savegames and user files, simply copy the files from the old language over to the new one. Start the game. All your old saves and user data will be back. The Usage of the tool AnyGameStarter has the advantage that you can have several profiles in several languages. As mentioned above not all values are valid for all Regions.